Extreame Savings Item! Save 46% on the Kung Fu Smith Large Bubble Dome Auto Open Rain Clear Stick Umbrella by Kung Fu Smith at SCRHI. MPN: KF7041WH. Hurry! Limited time offer. Offer valid only while supplies last. Rainy days no longer have to be so dull and gloomy. Kung Fu Smith Flower Bubble Dome Shape Rain Umbrella will cheer you up in any dismal weather. Rainy days no longer have to be so dull and gloomy. Kung Fu Smith Flower Bubble Dome Shape Rain Umbrella will cheer you up in any dismal weather. Made from sturdy steel, the umbrella is highly durable and capable of withstanding wind and rains. 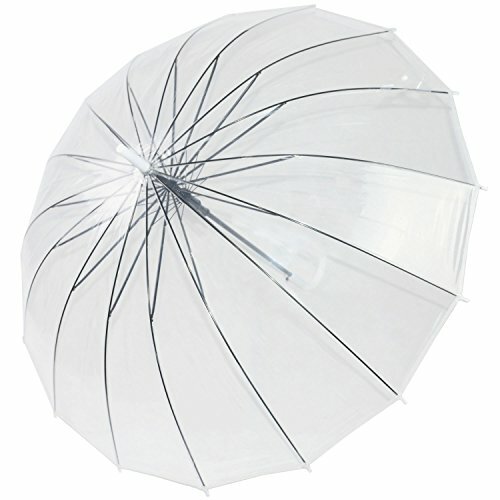 Thicken Durable Waterproof Clear EVA Umbrella Cover. Large Umbrella Canopy: Open Diameter 38 in. STURDY WINDPROOF FRAME: Reinforced High Quality 16 Black Stainless Steel Wind Resistant Ribs and Shaft Umbrella Bring You a Calm Temperament and a Elegant Round Dome Shape. FAST AUTO OPEN: One Second One Hand Operation. You Don't Want to Wait Another Second to Open the Umbrella When You Get out from Your Car in the Rains. Experience the Noticeable Difference of Staying Dry to Open the Clear Umbrella within a Second When You Have Your Hands Full. If you have any questions about this product by Kung Fu Smith, contact us by completing and submitting the form below. If you are looking for a specif part number, please include it with your message.